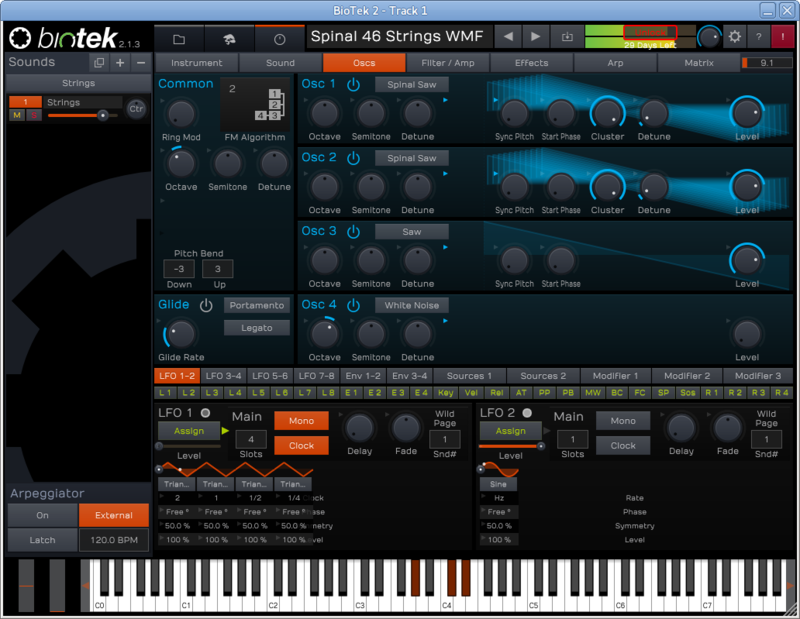 Biotek 2 is Tracktion's latest "organic" synthesizer, capable of producing a enormous range of sounds for use in music styles ranging from dubstep to electronica to industrial. 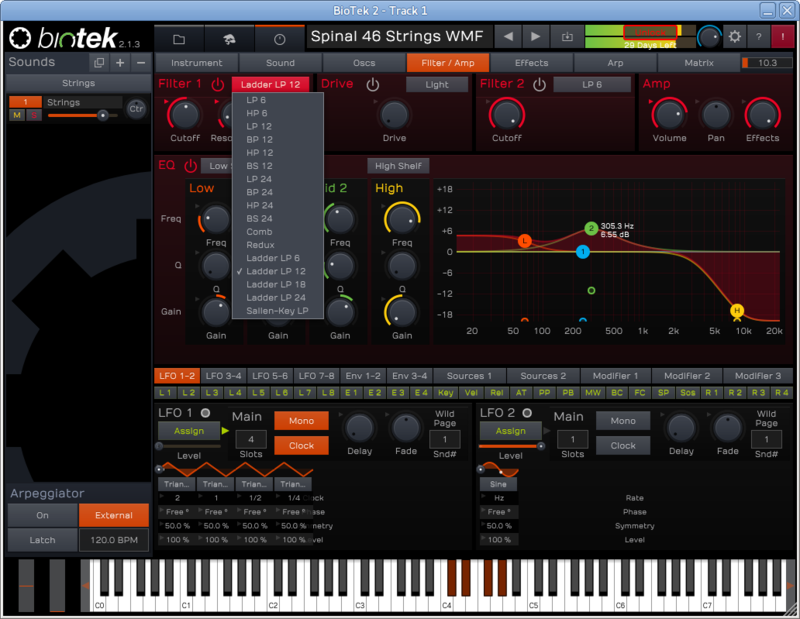 Cross-platform, it is available as a 64-bit VST plugin for the unix platform. Before purchasing, a 30-day demo can be downloaded for trial after creating an account on the Tracktion website (see link below). 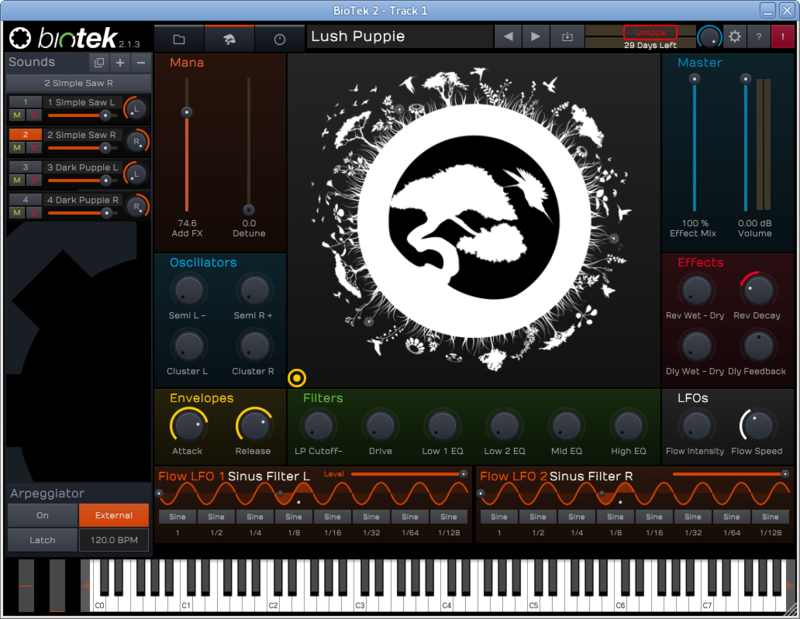 Biotek 2 is a realtime virtual sound synthesizer that utilizes both the standard waveform types found in analog instruments and samples--whether those included with the application such as natural, urban and environmental samples, or else the user's own samples. There are four oscillator signals for this, and each preset (called an "instrument") can contain four sound layers. Biotek 2 also includes FM control, two serial multimode filters, a host of effects (overdrive, compressor, chorus, flanger, phaser, delay, two reverbs, etc.) and the possibility of up to 200 assignable modulation controls, as well as eight LFOs, four envelopes and the very unique "Biotek 2 X-Y Ring" located in the center of the main GUI. A fully-controllable arpeggiator is also provided, with latching and host-synchronization capabilities. At the top right of the GUI is a "gear" button which controls some general settings, including controls to limit CPU consumption (ideal not only for older computers but also to limit competition for resources when other applications are running contemporarily). 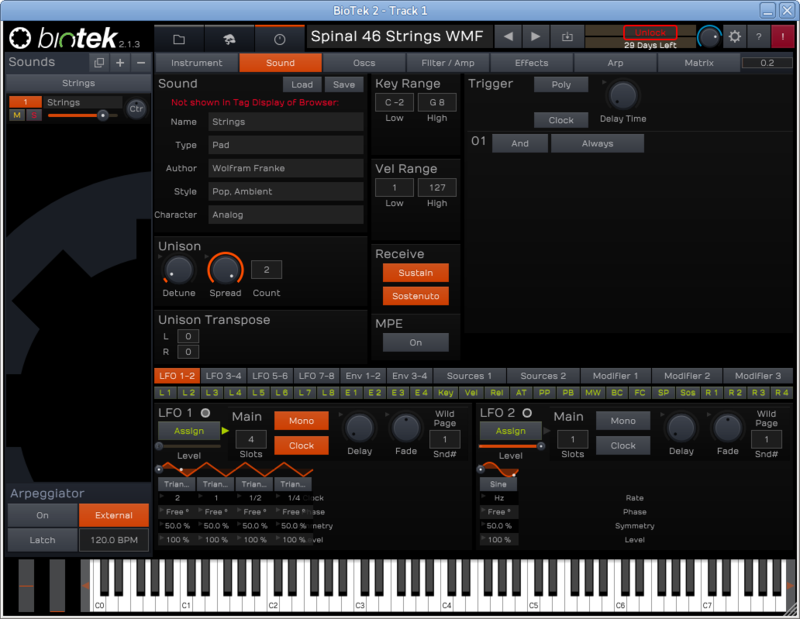 To the left are three tabs that access the main parameters of Biotek 2: the Preset Management tab, the Wild Biotek 2 Ring tab and the Edit tab. Preset Management is straight-forward, with four columns (Author, Category, Style and Character) which are very useful for quick preset identification. Deselecting all of these categories, the entire list of presets will be shown alphabetically to the right. Double-clicking any preset will load it. The Wild Biotek 2 Ring page includes the unique white modulation Ring at the center of the GUI. This ring is used as an X-Y modulation pad, to provide realtime cross-modulation control (with interesting graphic morphing between 'natural' and 'industrial' "worlds"), depending on which modulation options are applied to the pad. 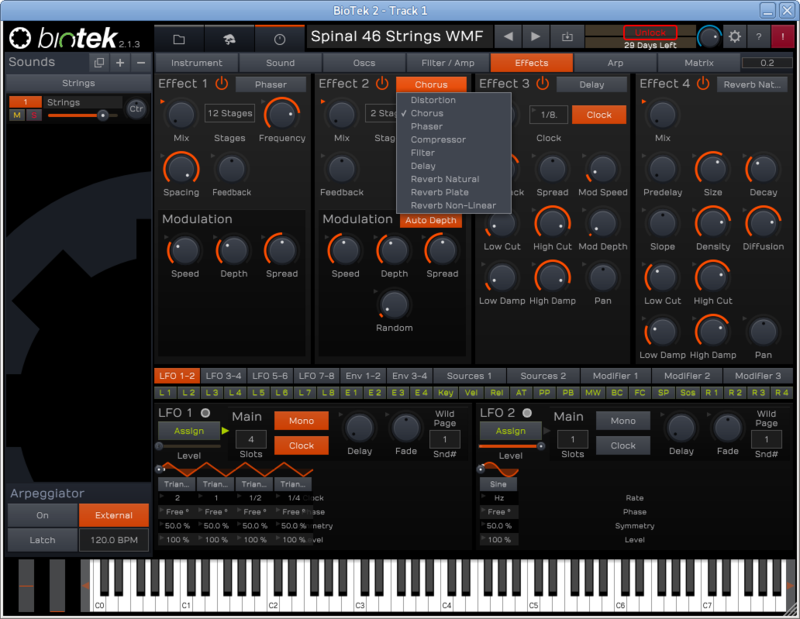 The Edit page includes several sub-tabs: Instruments tab, Sound tab, Oscillators tab, Filter/Amp tab, Effects tab, Arpeggiator tab and Matrix tab. 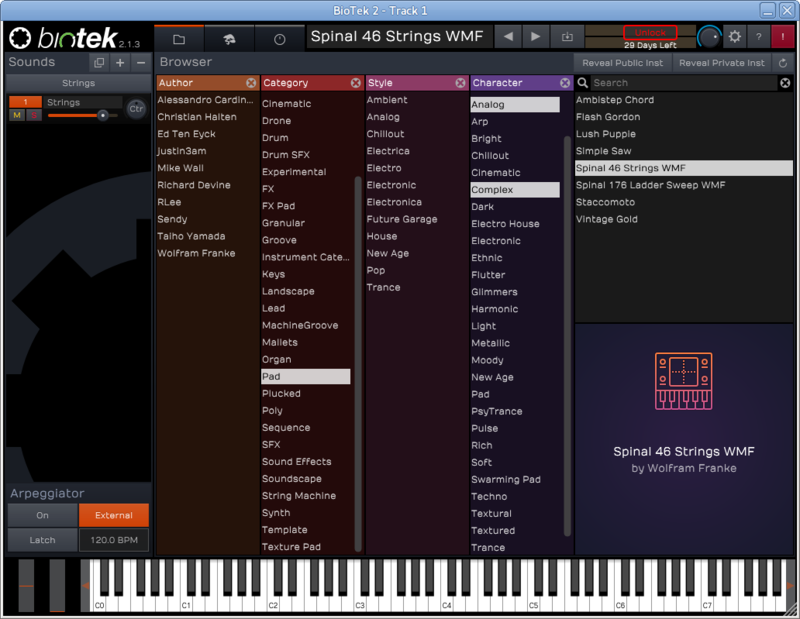 Each of these provides access to a variety of sound design parameters. For details, consult the downloadable manual at the Tracktion website link below.